Below are some commonly asked questions about the PGA Championship, the tournament run by the PGA of America that is one of professional golf's four major championships. Click on a question to view the answer, and for related info see our PGA Championship records page. 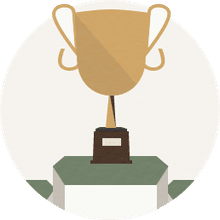 What is the PGA Championship trophy named? You won't just learn the name of this tournament's jumbo-sized trophy, but more facts and history about it. Find out how many golfers get to stick around for the final two rounds. If two or more golfers are tied at the end of 72 holes, what happens next? What meals have been served and gifts given at the PGA Champions Dinner? Did you know that there is a "champions dinner" at the PGA Championship, too? When and where was the first PGA Championship played, and who won? The PGA Championship was first played in 1916, and Jim Barnes was the inaugural champion. The tournament was played at Siwanoy Country Club in Bronxville, N.Y. In the final, Barnes defeated Jock Hutchison, 1-up. What was the prize money at the first PGA Championship? A total purse of $3,000 was available to the golfers at the 1916 PGA Championship. Doesn't sound like much, but that was big for its time. The winner, Barnes, earned $500. 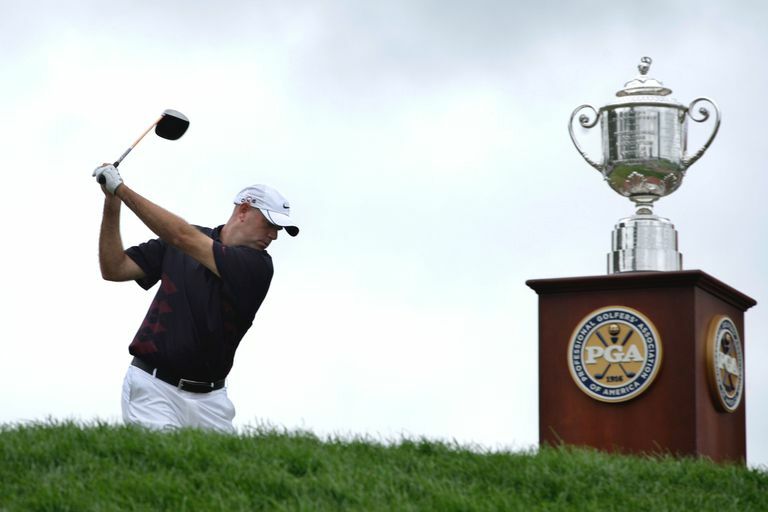 Who hit the first shot in PGA Championship history? The first stroke ever played in a PGA Championship was struck by Thomas Kerrigan. Kerrigan was drawn against Charles Adams in the first match on the course at the 1916 PGA Championship. And Kerrigan teed off first, making his drive the first shot in the history of the PGA Championship. Kerrigan defeated Adams in that match, 6 and 4 over 36 holes. He then beat Tom McNamara in the second round before losing to eventual champion Jim Barnes in the quarterfinals. Who was the last match play winner? The PGA Championship was a match-play tournament for the final time in 1957, and the winner was Lionel Hebert. Hebert beat Dow Finsterwald in the final, making him the last match-play champion. Who was the first stroke play winner? The tournament switched to stroke play beginning in 1958, and Dow Finsterwald was the first stroke-play champion. Who is the youngest winner of a PGA Championship? Gene Sarazen. He won the 1922 PGA Championship at age 20 years, 5 months, 22 days. Who is the oldest PGA Championship winner? Julius Boros, who won the 1968 PGA Championship at age 48. Which also makes him the oldest winner of any major. Who holds the record for most PGA Championship wins? The record for most wins by one golfer in this tournament is five, a record shared by two golfers: Walter Hagen and Jack Nicklaus. Hagen won in 1921, 1924, 1925, 1926 and 1927. Nicklaus won in the 1963, 1971, 1973, 1975 and 1980.
Who was the first golfer to win the PGA Championship twice? Who was the first golfer to win the PGA Championship three times? Walter Hagen, whose first three victories were in 1921, 1924 and 1925.
Who was the first 4-Time winner of the PGA Championship? Hagen again. After winning in 1921, 1924 and 1925, he added No. 4 in 1926. What is the largest margin of victory in a PGA Championship?